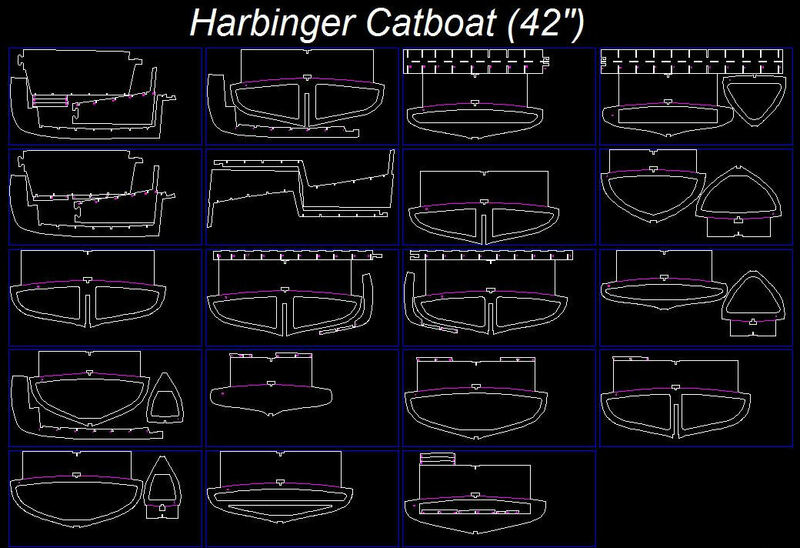 MW240 1/8 scale 1889 Harbinger Cat Boat 42″ length! One of our regular clients likes to have unique models. 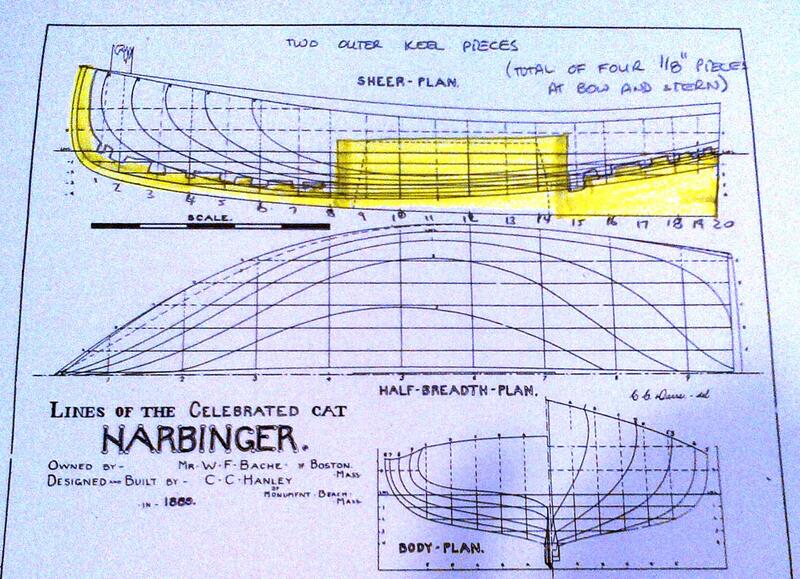 After a long search, he came to us with this lovely Catboat design. These lines were found in Rudder magazine from March 1919. 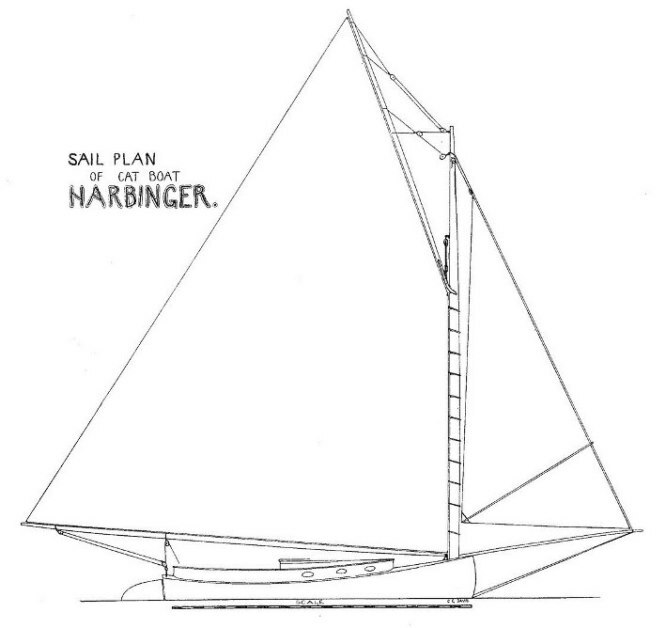 The Harbinger was designed and built by C.C. Hanley of Monument Beach, Massachusetts, USA, in 1889. She was 28 feet overall with a huge beam of 13 feet 6 inches. She was ballasted with 4,600 pounds of lead. In her early club racing season, she was a regular winner until she broke her original mast. The replacement, it turned out, was not as efficient and the yacht had a series of defeats. In the 1892 issue of “The Rudder” the owner notes that it was his “intention to put in a lighter mast, and bring her to her original condition”. Some research would have to be done to follow up on that statement. Who knows? Such lovely lines and such an interesting story could not be left un-modelled so we set about creating a lovely representation of Harbinger. The first order of business was adding some stations. The original drawings seemed to show a scale of about 1/42 and we wanted this model to be 1/8 scale. We doubled the number of stations and doubled up the thickness of the frames where the mast was going to be inserted. 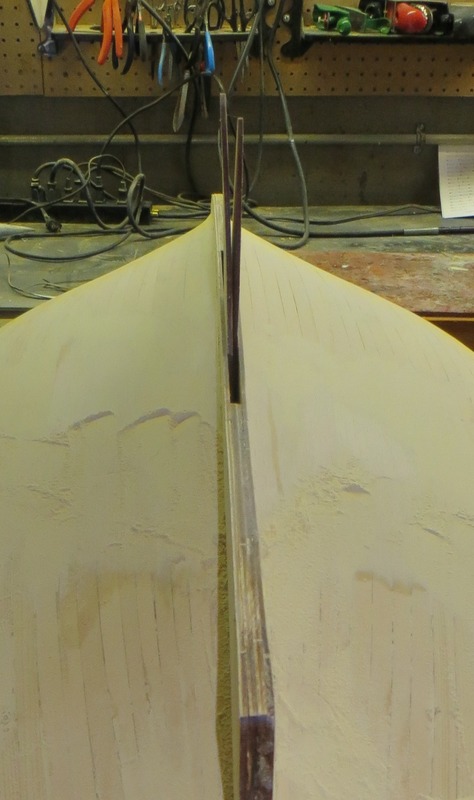 Since we were using 1/8″ birch plywood, we were able to divide the keel up into four sections. 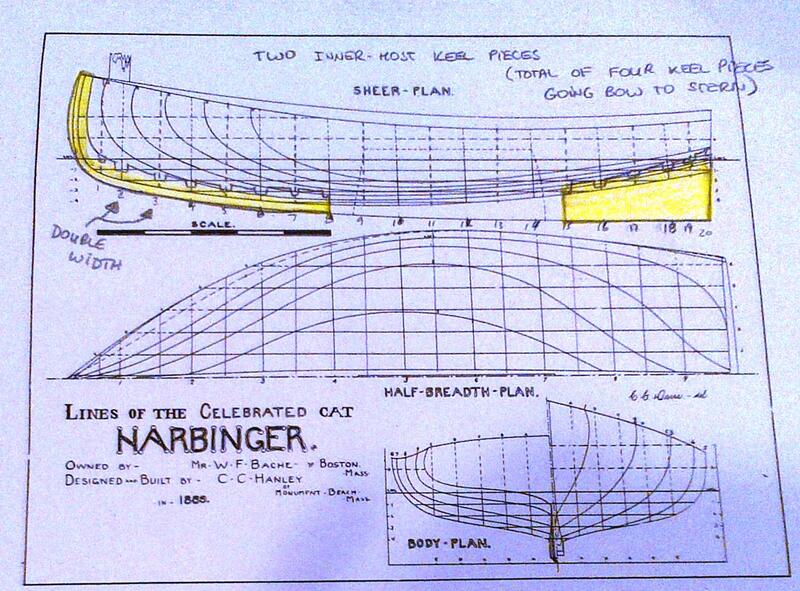 Two of the keel sections would run bow to stern and make up the outsides of the centerboard box. 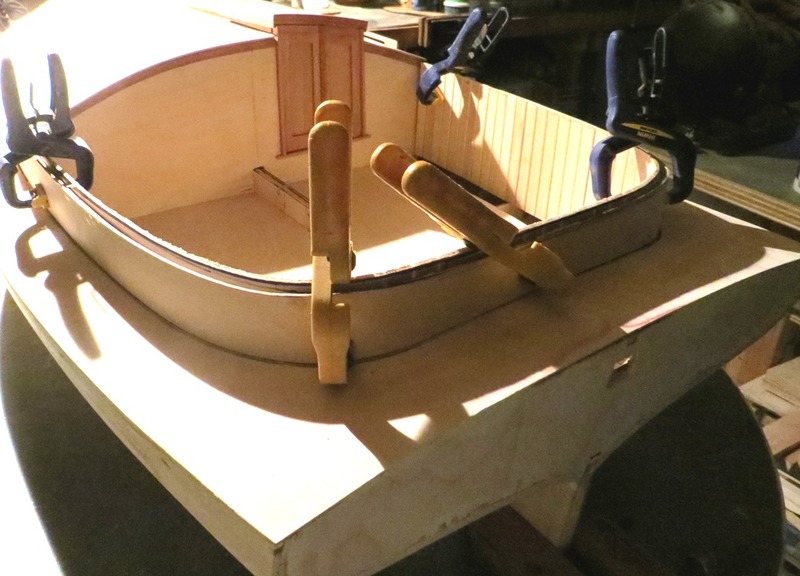 In between the two boards that run bow to stern we inserted four shorter sections, that stop at the centerboard well. 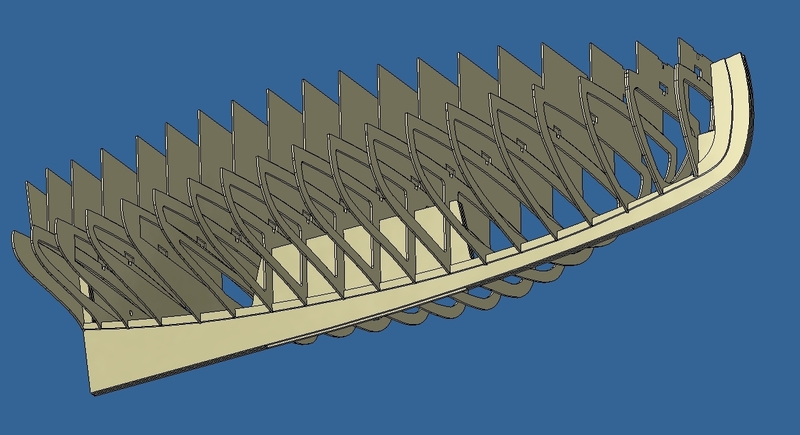 The total width of the keel is 1/2″ or about 4 inches in real size. This seemed about right and it was time to translate the design ideas to CAD. 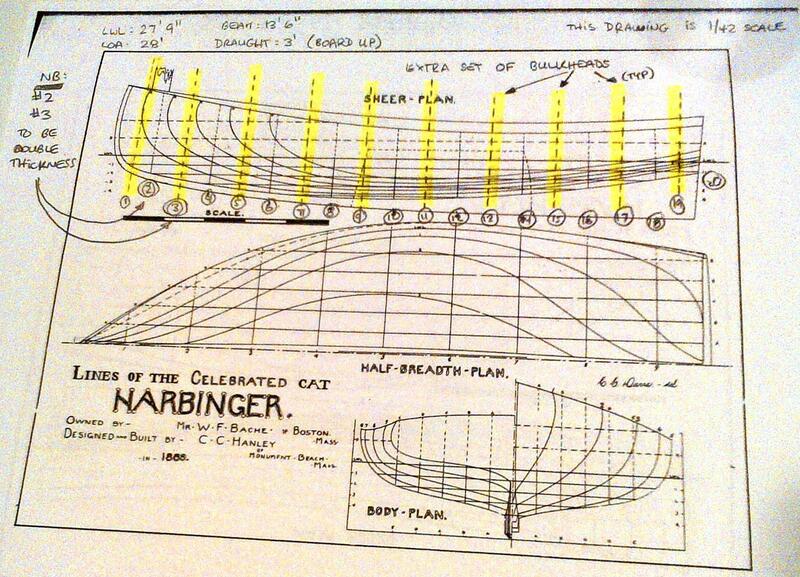 First the lines on the drawings were transferred to Autocad Inventor, where they were transformed into a surface representation of the boat. This 3D surface was tweaked until we were within 2% of the original lines pretty well everywhere. This surface was then offset by 1/8″ to allow for planking and the stations were extruded in the positions wanted. Here is an overall look of the assembly in a simple 3D rendering. 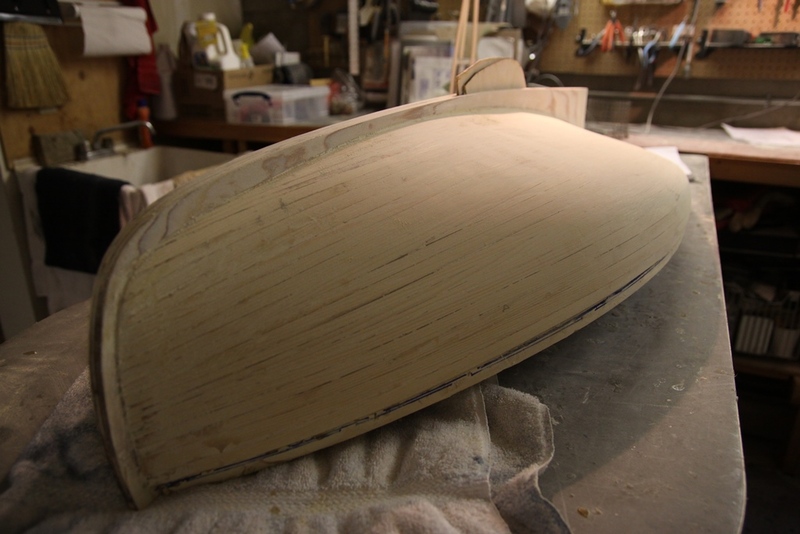 Even at this stage, we could still see the boat’s surfaces and could still go back and tweak the shape if we needed to. Everything looked good. Look closely and you can see the double frames at the bow. Here you can also see how we left plenty of space inside the boat for electronic equipment and servos. By varying the position of the 3D rendering, we get a better view of the centerboard well. As discussed above, this is made of two walls that stretch bow to stern. In this picture we can see the well detail quite clearly. This should be plenty of space to get the board up and down as needed. As the top of the well will be closed, no water should be able to get in this way. If you had a close look at the previous 3D rendering, you may have noticed an unusual line. 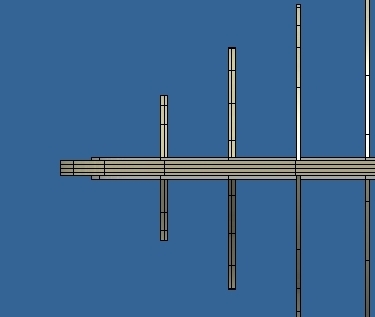 In our earliest discussions with the client, he had asked us to make a support for the lowest plank in the hull, in order to avoid cutting a rabbet out of the keel. This was a great idea but we forgot to put it in the original design. So we added a number of sections between the bulkheads. This was not as elegant as making one, long, interlocking part, but it seems to have done the job. 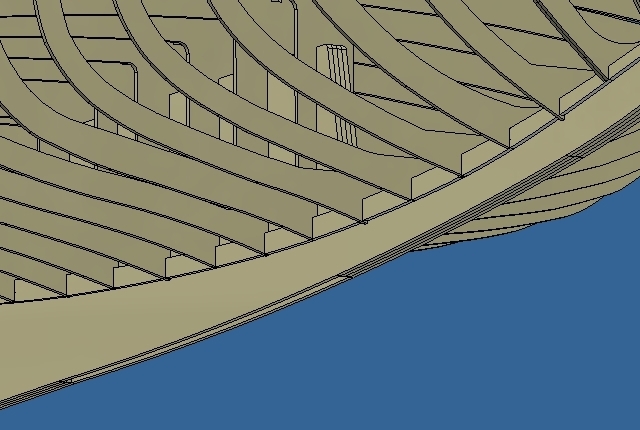 In this last picture of the rendering, you can see the total number of 1/8″ boards that are used to make up the keel and the rabbet. 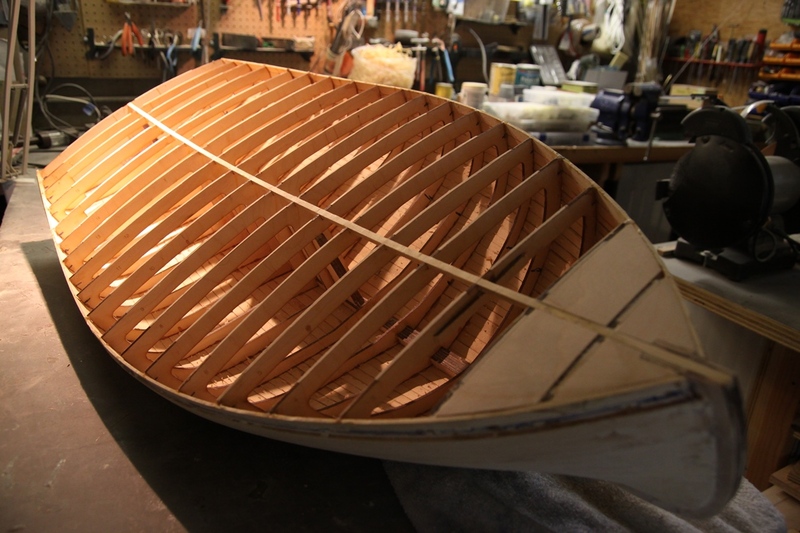 with a solid 1/2″ at the bow, this works out to a four-inch keel at the bow and the stern. This will look perfect on the model. Once the design is approved, the parts are removed from the assembly and a drawing is made. This drawing is then adjusted to fit the dimensions of the 24″ x 12″ sheets of birch plywood we use in our laser cutter. Note that all the parts are numbered so there is no need for an assembly manual or plan sheet. Everything is self-explanatory on the wood itself. At this point, we let the client do the talking. We generally get great feedback from clients and this project was no exception. Considering these are one-off designs, and we do all the simulation and testing in 3D programming, we are very pleased with the results. If we had to make prototypes, like in the old days, the cost of this work would be triple or quadruple what we ask. Knowing how to use good technology makes things better, faster, and more fun! 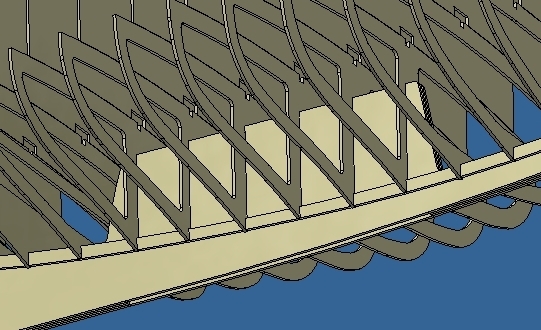 Here we have a picture of the bottom of the boat showing the nice, chunky, keel and the slot for the centerboard. I’m sure there was a lot of sanding and faring to get this right, but the results look great. Here we can see how the increased number of frames give the model a most realistic look. The client said that, after assembly, he cut sections of these frames out in order to insert his equipment and the boat’s cockpit. Here’s a nice picture of the cockpit under construction. My client is also using my laser-cut gratings for the floor of the cockpit and some other areas of the model. I’m looking forward to seeing the result. 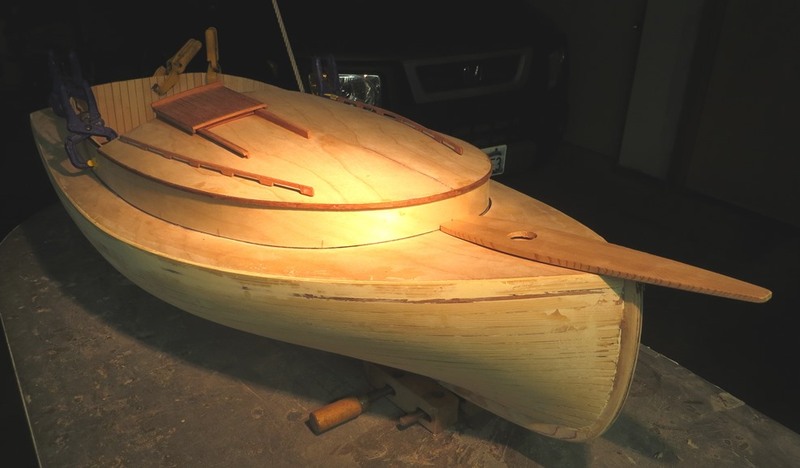 Here’s a nice view of the centerboard well and a little of the planking, after faring and sanding. There sure is a lot of work that has gone into this model. I can’t wait to see it afloat. From this point on, our input is minimal. 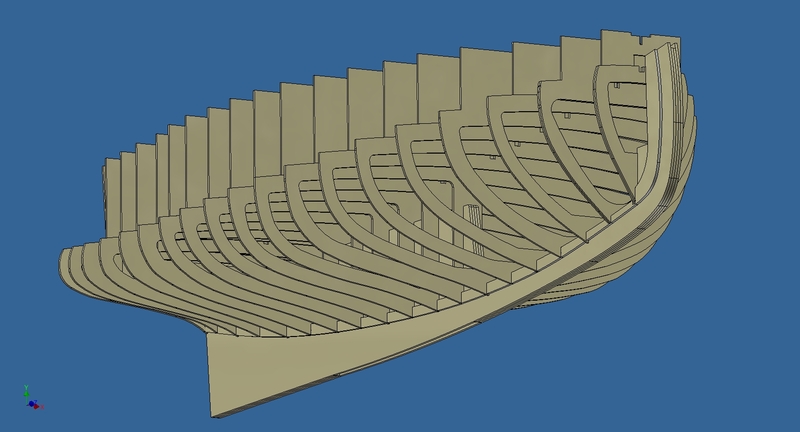 We’ve delivered a nice support structure for a lovely model and the client seems to be well on his way to building an excellent representation of the 28-foot Harbinger Cat Boat. I’m not sure how much time we’ve saved him by cutting the frames for him but I suspect it’s many, many, dozens of hours of work. It’s been a real pleasure putting this project together and we are ready to build one for you.